4 Pics 1 Word screen at airport. Departure and arrival. Man and woman looking at map. World lit up with connecting lights and lines. Globe surrounding by famous landmarks. Leave your comments at the bottom of the page, we will be happy to know your opinion and help you with all the answers you will ever need at all times. The puzzles in 4 Pics 1 Word are randomized, so the levels are different for each player. That means you can’t search by level number. You have to find your answers by word length. 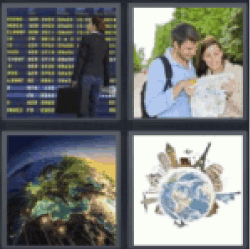 4 Pics 1 Word screen at airport.